I had been considering one of Tissot’s new PRC200 automatic chronographs for quite some time and finally decided to take the plunge. I am very pleased that I did! The PRC200 series comes in a variety of dial colors with either stainless steel bracelets or leather straps. The black dial looks like a winner, but being the iconoclast that I am, I chose the grey dial. I really like grey dials on watches and this color is rather difficult to come by. Please note that in the stock photos of the PRC200 with the grey dial, the color looks darker grey, like a charcoal grey, but trust me, the color is grey, the normal, medium grey color you would expect grey to be and that’s just fine with me. The watch looks fantastic. What makes this watch unique is the movement. 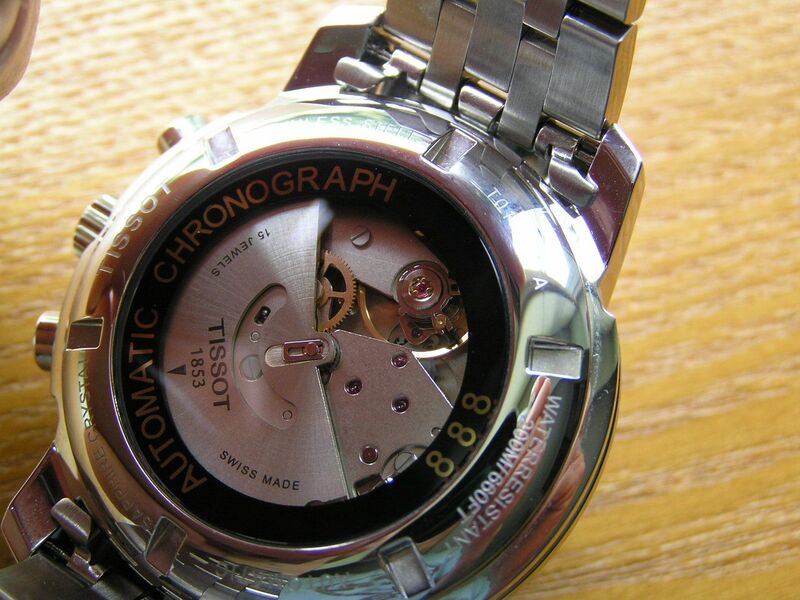 When the Swatch Group (of which Tissot is part of) introduced its new 15-jewel automatic chronograph movement about a year or so ago in several Swatch models, people were talking, especially since the watch cost about $350 USD, which is unheard of for a new, Swiss-made automatic chronograph in the 21st century. People were also abuzz because the movement was reported to be non-serviceable, contained plastic parts and its reliability was unknown. Well, from what I have gathered, the movement is based on the well-known and extremely rugged Lemania 5100 chronograph movement, which contained plastic parts and was known for its dependable service and accuracy for many years in a variety of Swiss branded watches. I owned one Lemania 5100-based watch, a Revue Thommen Airspeed and it was a terrific piece. Plastic pieces in a movement don't scare me and the plastic/nylon used has its own lubricity and helps to keep things moving as they should. 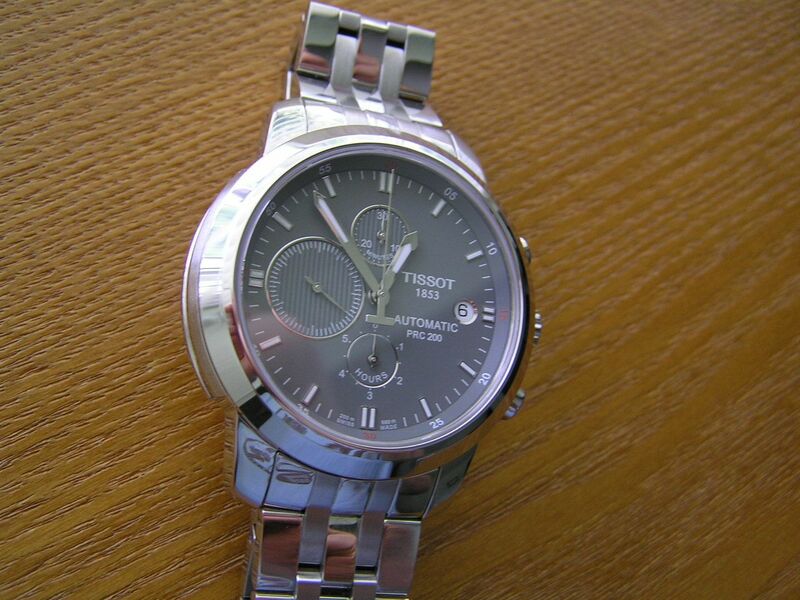 It is interesting to note that in the instruction manual, Tissot does not say anything about servicing this movement. 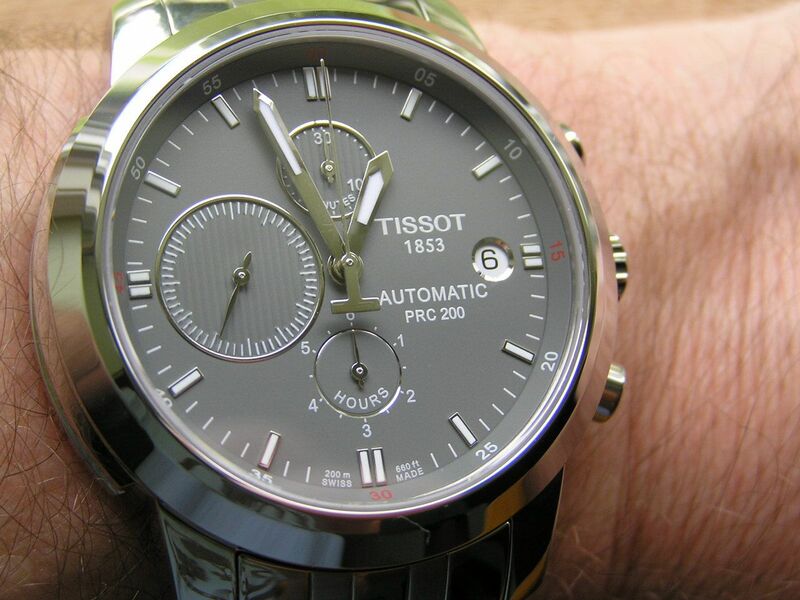 They only say it should be ‘inspected’ every three to four years at an authorized Tissot dealer. So apparently, Tissot does consider the movement a non-serviceable item, but that does not necessarily mean that a competent watchmaker somewhere couldn’t disassemble it and service it. Time will tell, as more of these movements make their way into the marketplace and people start looking into how they’re put together. For now, I feel this movement is a winner. This Tissot PRC200 starts with a nicely detailed polished and brushed stainless steel case measuring 43.3mm without the screwdown crown. Lugs are 20mm, case thickness is substantial at 16.1mm. 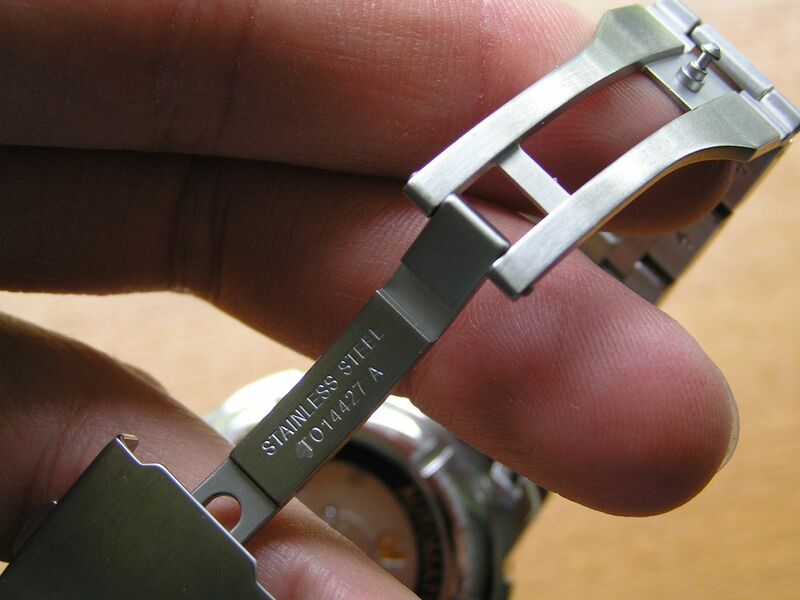 The caseback is a display type which screws down and shows the automatic movement with its signed rotor. What is great about the case is the detailing on the case sides, which has a groove machined into each side that run from lug to lug (see photos.) 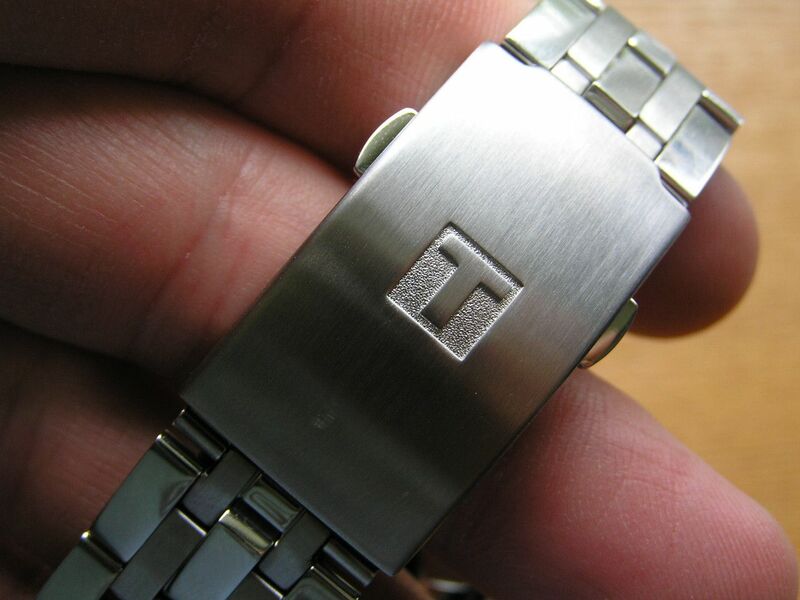 This detail gives the watch a more expensive look and is something you don’t see everyday. 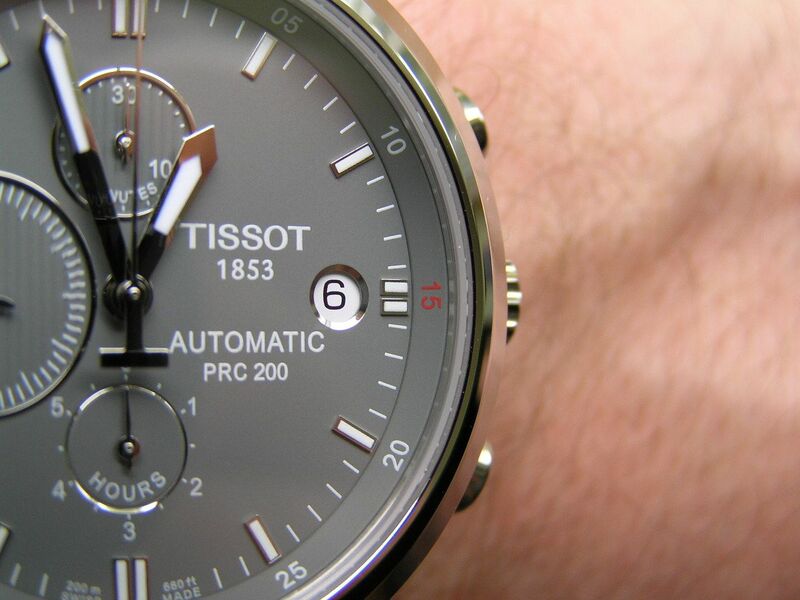 So a tip ‘o the hat to Tissot’s designers for adding this nifty touch. The crystal is flat sapphire and fits perfectly into the case, with no distortion or undue glare. The dial as mentioned before is perfect medium grey. The dial has a nice design with its oversized seconds subdial and subtle red arabics on the chapter ring at each 15 minute mark. The rest of the arabics on the chapter ring are white, along with the simple markers at each five minute mark. The dial does look a bit plasticky, but it seems to come with being grey, as other grey dialed watches I’ve owned had the same look. This is not a distraction and is not a reason to not purchase this watch. I just wanted to make you aware of this and others may feel it looks fine. The quickset date is at 3, with a round window framed by a stainless steel trim ring. The top subdial at 12 is the chronograph minute totalizer (as printed on the dial with ‘minutes’) and the bottom subdial at 6 is the chronograph hour totalizer up to six hours. The oversized subdial at 9 is the seconds hand for the watch, while the seconds hand for the chrono is a simple silver stick style hand with a ‘T’ at the end. 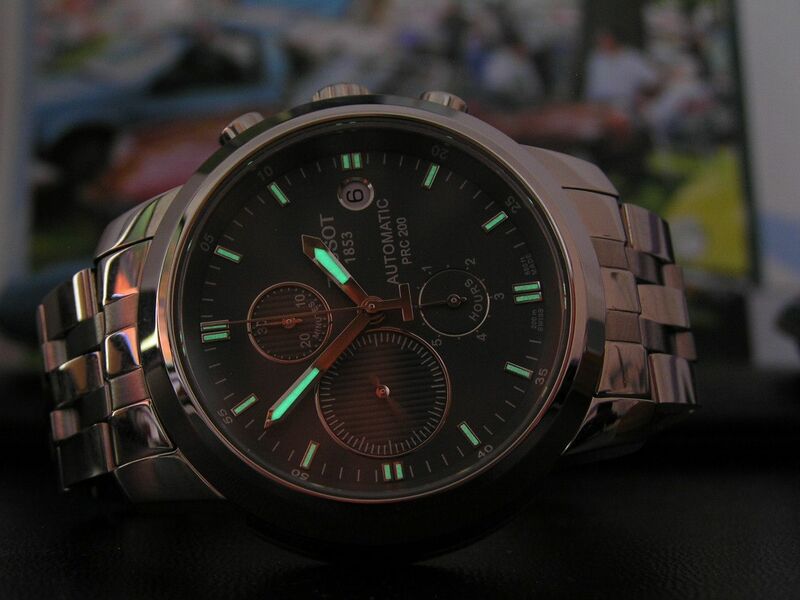 The hour and minute hands are silver with inset lume. While they can look cheapish in stock photos, believe me, they look much better in person. 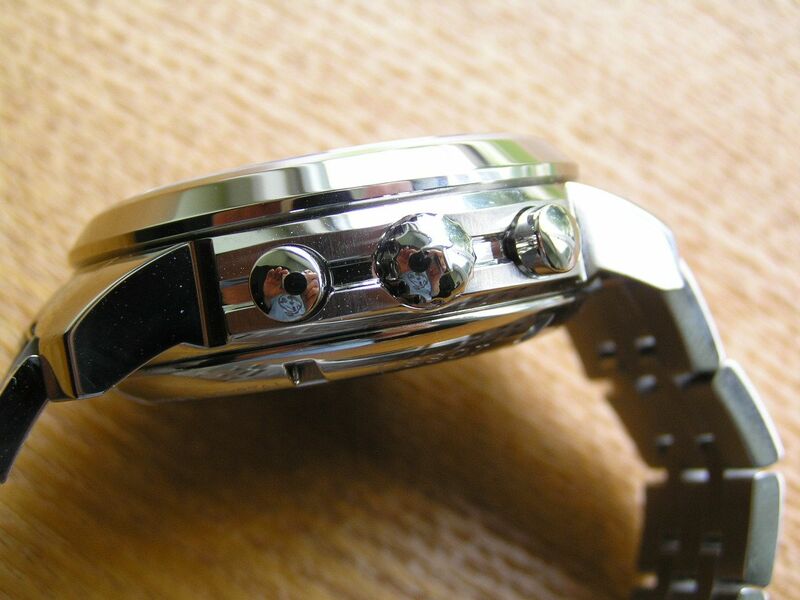 Another nice touch on the dial are the stainless steel rings around each subdial. They don’t look garish and really add a touch of class to the overall presentation. Lume quality is fine. The watch is factory rated for 200 meters of water resistance. The automatic movement winds very smoothly and has a winding sound very reminiscent of the Lemania 5100 which makes sense, since this is the movement it’s based on. Accuracy out of the box has been about +10 seconds over 24 hours, which is very acceptable. Power reserve is a fine 51-3/4 hours. One thing I appreciate about Tissot is that they put plenty of threads on their crown tubes, as the crown on this PRC200 screws down with almost five full turns. The crown is knurled, but could be a bit larger, as it’s a bit hard to grasp and turn. 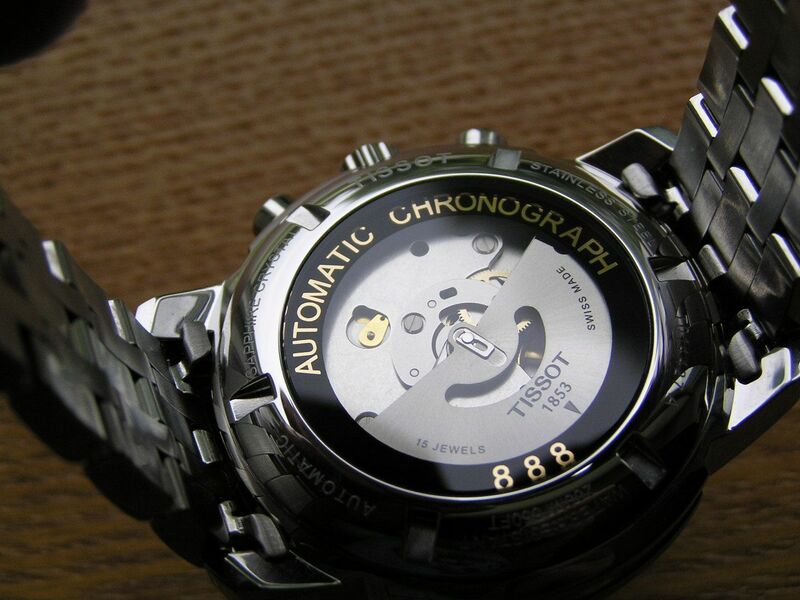 Chronograph accuracy seems fine, and the movement stops, starts and resets with the expected crispness. A six hour chrono is a bit odd, but it beats a 30-minute chrono. The pushers are plain stainless steel with nothing to make them stand out. 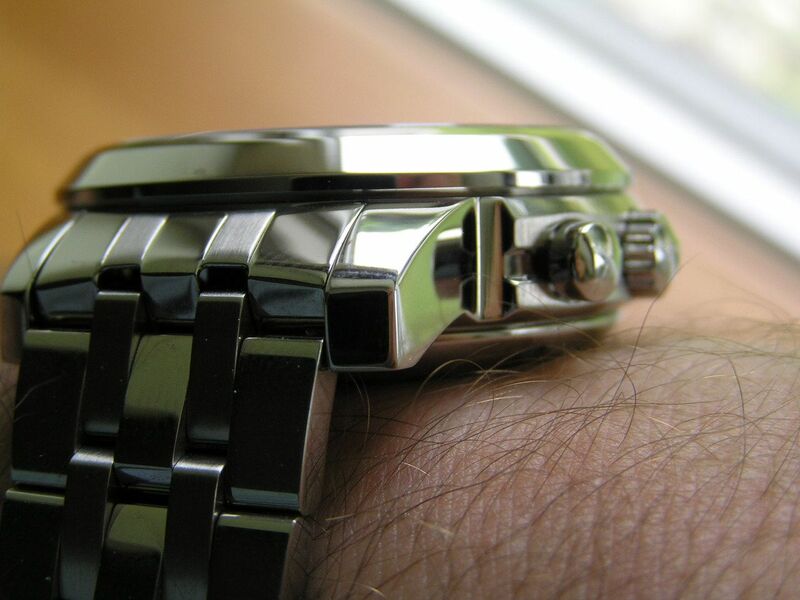 I was initially concerned about the bracelet on this watch, because it looked very similar to the bracelet that came on the Tissot Seastar 1000 that I owned, which was somewhat rattle-prone at times. I am happy to report that the bracelet quality has exceeded my expectations, despite having folded end links, which I knew going in. The bracelet is 20mm at the lugs and tapers to about 18mm at the clasp. The bracelet links are solid, polished and brushed and consist of five pieces. Adjustment was straightforward, with standard split pins. 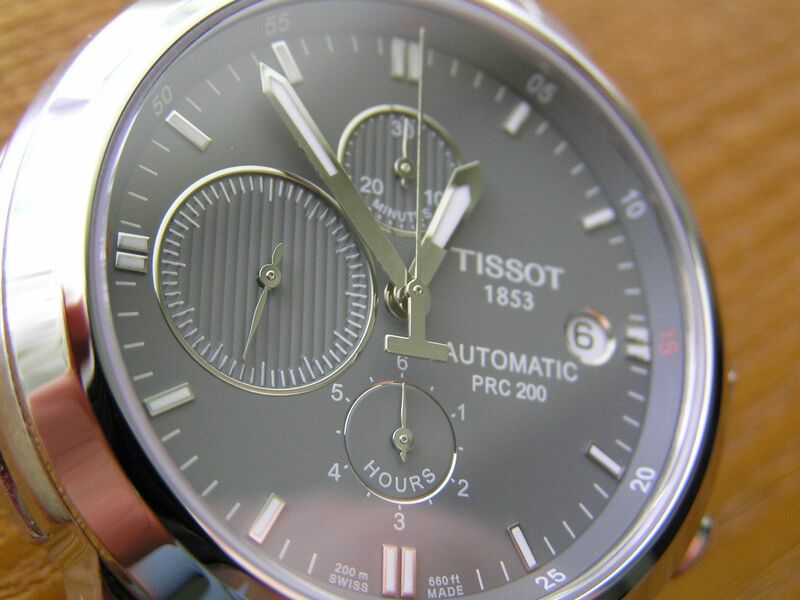 The clasp is a pushbutton design and is signed with the Tissot ‘T’. One disappoint is the lack of enough micro-adjustment holes on the clasp. There are only two, when there should be at least four. 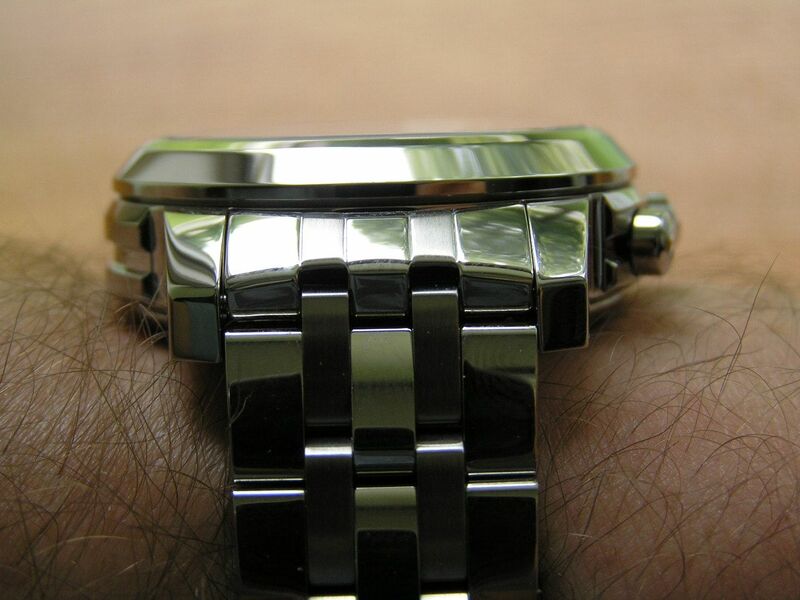 The way the watch is sized for my wrist, it is almost too tight, but if I put a link back in, it would be too loose, because the links are rather large and with only two microadjustments, your options are limited. If you’re concerned about this, maybe you should order this watch on the leather strap. 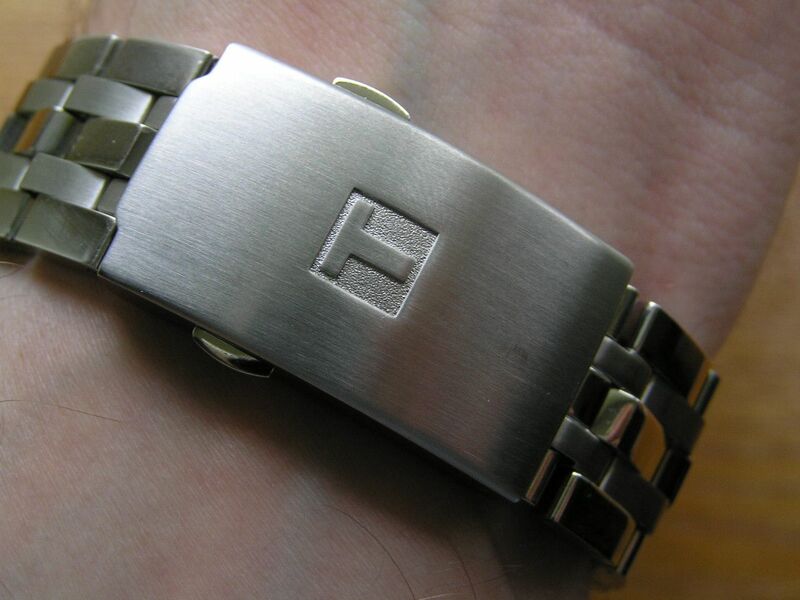 One strong positive about the bracelet, is that is has a proper machined deployant. And so far, the bracelet is not noisy, so overall, it gets a thumbs up from me. 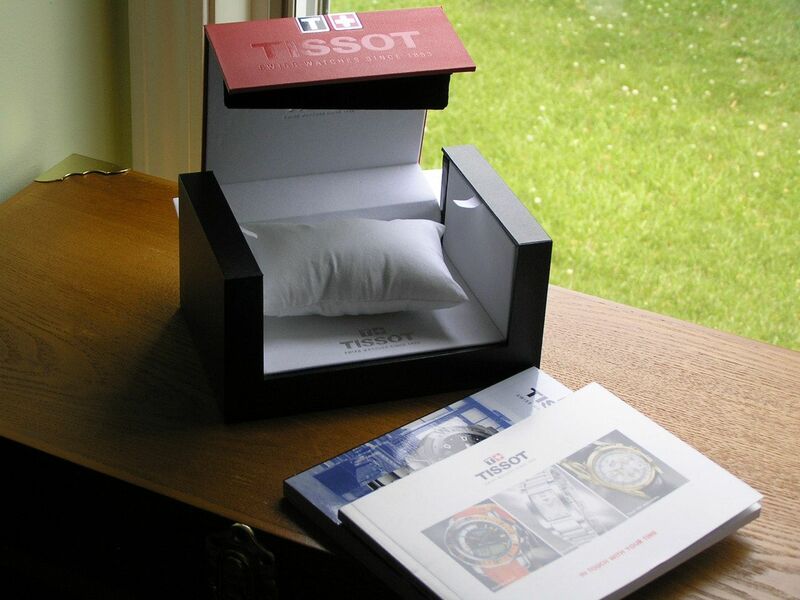 Tissot also gives you a beautiful presentation with this watch, with their drawer-style box that holds the watch and has a drawer on it for the history of Tissot book that they include. A polishing cloth is also included. A nice box is always a welcome surprise and especially for the price of this watch, this presentation exceeds many pieces priced the same. And about the price...getting a new, Swiss-made automatic chronograph with a brand name on it in the $500 to $600 USD range has to rank as a true bargain and that’s where the PRC200 automatic chronographs come in. They exhibit strong value with really no drawbacks, the biggest being the serviceability of the movement, which is still under review. 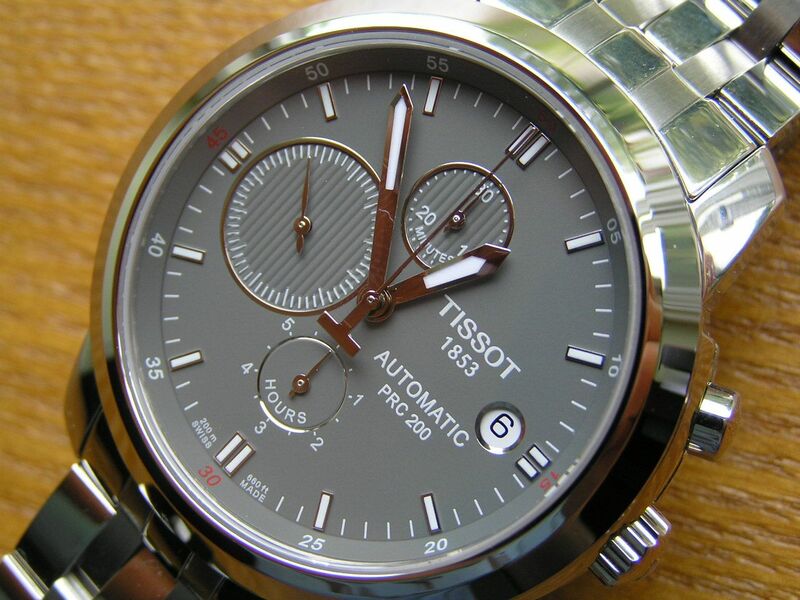 So for the price, you cannot go wrong with the PRC200 automatic chronograph series from Tissot. Great looks, good performance and pricing that’s hard to beat. You're not winding the watch enough. Before putting it on, give it 50 turns of the crown to fully wind it. That should give it a full power reserve of 50 or so hours, so when you take it off at night, it should run well over the 12 hours you're getting now. Also, if you're not super active while wearing the watch, the watch won't build up or maintain that much of a power reserve, so that's why I always like to fully wind my automatics prior to wearing them. So i have the same one with the black dial , I have noticed that the date doesnt change at the stroke of mid-night .. but by 12:50 ... do you notice the same and is that normal ? Normally, the date should change right around midnight, or up to 10 minutes before or after. But all watches are different and the fact that yours is still changing over within the midnight hour doesn't indicate a problem. If it really bugs you, a watchmaker can reset the hands so the date changes at midnight, but it's not worth the hassle, IMHO. Just live with it and enjoy it. Stellar review! I've had my PRC200 for a few days now and love it. I wonder what the benefit of having the watch inspected every few years might be if even an authorized dealer isn't meant to service it. In other words, what do we have to gain from paying for inspection? Also, have you heard anything more re: the long-term outlook of the 888 movement? The only reason to have an AD inspect every few years would be to check the water resistance, but that is only really necessary if you are actually getting the watch wet on a regular basis. As long as the watch is running fine and the chrono functions work, just keep using it and enjoy it. Haven't heard anything recently about the long-term aspect of the movement, so I wouldn't worry about it. Hi, I am planning to buy the same watch and wondering hows your experience so far. Any problems with the movement observed ? 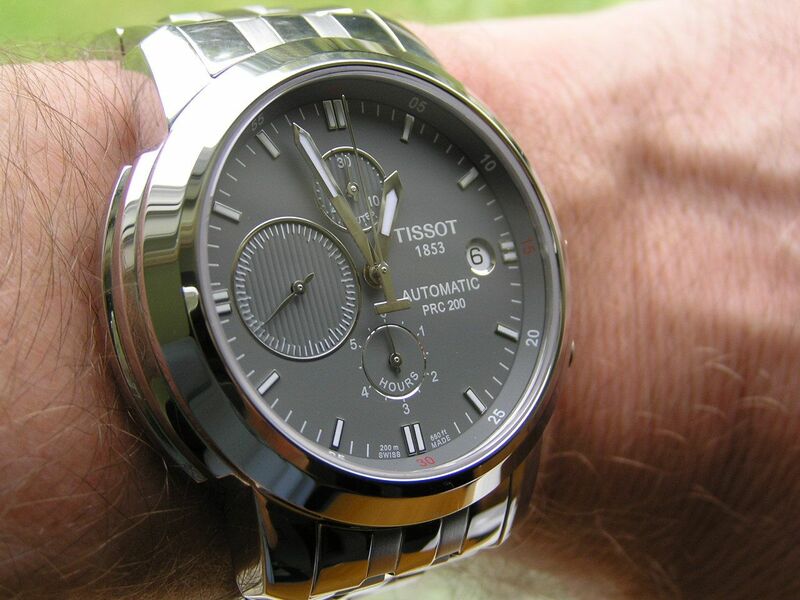 I sold the Tissot about nine months after I purchased it, so I cannot comment on long-term performance of the movement. The party I sold it to has not told me of any problems and I have not read or heard of any problems cropping up with that movement. If you're planning on getting one, I would not have any worries. My PRC200 required service a couple of months ago. The chrono minute hand was resetting to @24 (just between the 20-30 min mark). Sent it to Tissot repair service, and they quoted the repair at $565... about what I paid for the watch when I bought it. 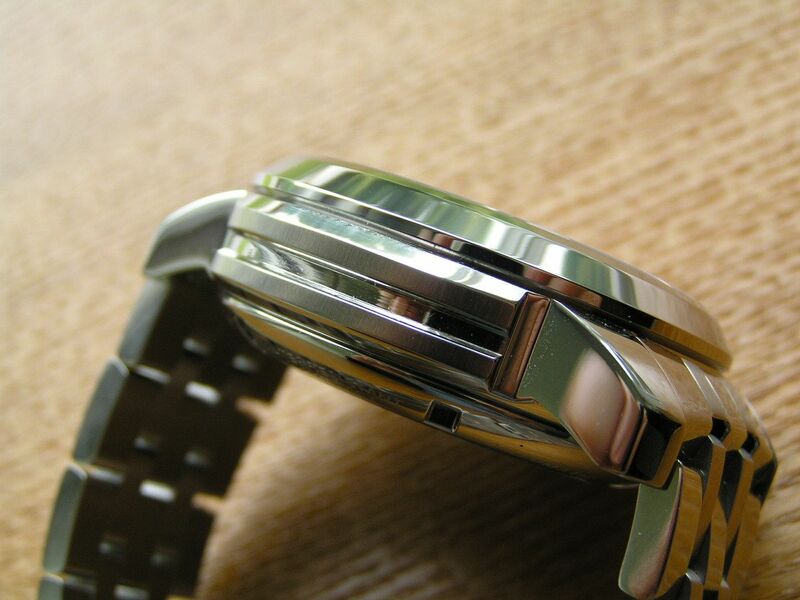 So, yes... Tissot considers the movement "unserviceable". Fortunately I found a watchmaker in Ohio who serviced the watch for about $250. I got one as a wedding present 5 years ago and I had it serviced once free of charge as it would lose 5 mins every 24 hours. It went away and was as good as new when it came back. Doesn't lose time anymore. 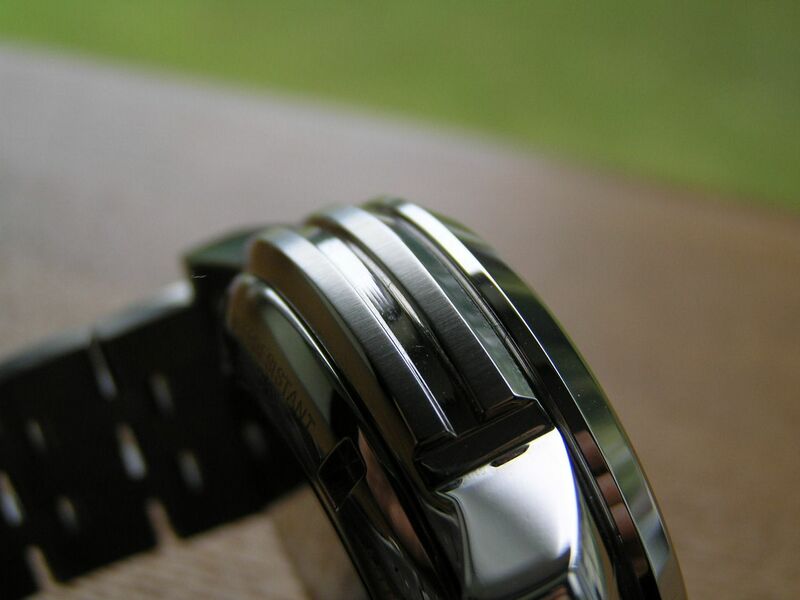 I would recommend it to anyone wanting a watch that lasts.